to evaluate the past and to formulate a strategic plan for future. It was to evaluate the past activities and to form a strategic plan for future. NECHA had its AGBM on 2nd and 3rd September 2011 at Bakdil Training Centre Tura. 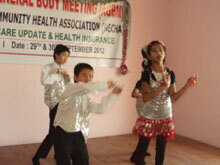 The theme of the AGBM meeting was “Health Insurance”. The chief guest was Shri Sanjay Goyel, Deputy Commissioner of West Garo Hills, and the guests of honour were Most Rev John Moolachira, Co-adjutor Archbishop of Guwahati and Most. Rev Andrew Marak, Bishop of Tura and Rev. Dr. Tommy IMS, Director General of CHAI. 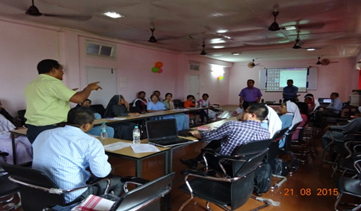 AGBM of NECHA was conducted from 29th to 30th September 2012 in NECHA premises. 56 representatives from Member Institutions were present excluding the invited guests for the AGBM. 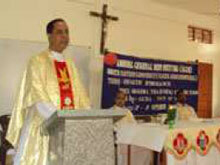 Prominent persons like Most Reverend Bishop Joseph Aind SDB of Dibrugarh, Rev. Dr. Fr. Tomi IMS, director general of CHAI, Secunderabad and Dr. Ishi MMBS, DNB (MEDICINE) from Dispur Hospital were the special invitees for the meeting. The theme of the meeting was, “HEALTH CARE UPDATE AND HEALTH INSURANCE”. Inaugural session was made more colourful by songs and dances of children from Savio School Baridua and Jyotiniketan School Narengi for the blind children. NECHA has launched out its health care programmes into rural areas. 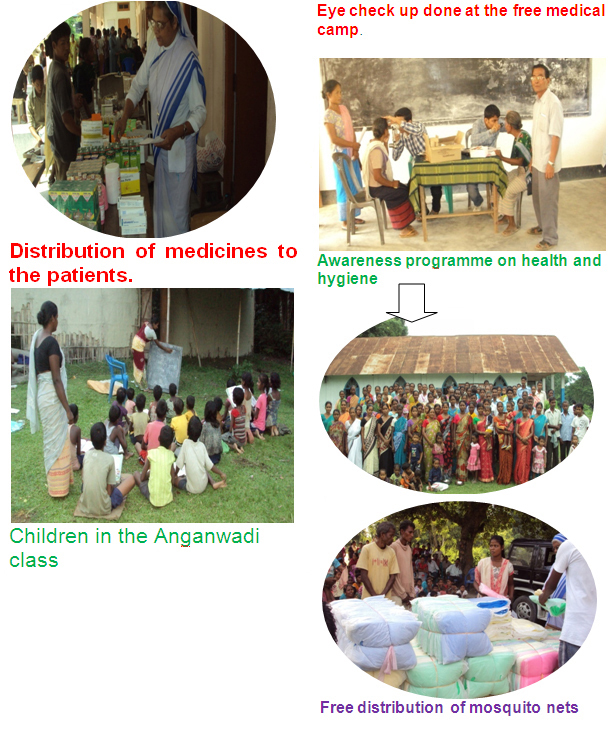 Awareness programme on Health and hygiene, education and motivation programmes for youth are regularly conducted in the 10 villages of Tangla Parish. Free distribution of 200 mosquito nets and 5 health camps were also conducted. Training of 15 youths in IGP is being conducted at various places for driving, welding and Tailoring. NECHA takes special care to provide medical and educational help to less abled children of the society. At present NECHA is helping 54 children of such for education, treatment and rehabilitation and also providing Vocational training to those who are able to undergo training. 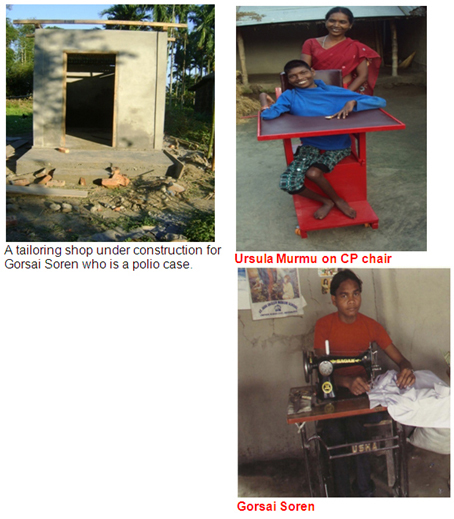 Few of the children are settled in life after the training in tailoring at Montfort special School. Rev. Fr. George Parackal, Director of NECHA, 2007-2013 returned to his Diocese, Kohima after handing over the role of Director NECHA to Fr.Paul Thettayil, Diocese of Dibrugarh who took charge on 1st April 2013. Seek and promote representation in various nodal Societies of the Govt. Set up to promote diseases control e.g. Blindness Control Society, at regional, state and district levels. Gather and disseminate information related to health promotion, treatment of diseases, innovations and breakthrough made in the world of medical research etc. Publish information on treatment of common diseases with common herbs available in the area through publications like ‘Swasthya Patrika’. Empower the D.Us and enthuse the MIs to function more efficiently. To encourage the DUs by Strategic Planning Process (SPP) and update the recent Health Issues. NECHA renders immediate help and relief Services to the flood affected people, & people affected by ethnic Violence and malaria. Assistance also rendered to identify suitable resource personnel for handling health on related topics. SR.MARINA ABRAHAM SCC of Harmutty, DU president of Tezpur was elected PRESIDENT OF NECHA FROM 2014. SR.ANCY JOSEPH CCV, Preisdent of Miao DU president was elected Deputy Secretary of NECHA from 2014. EXECUTIVE BODY MEETINGS of NECHA:- 8.30 am on January 29th,2015 at Guwahati and second Meeting at 8.30 am on May 27th 2015. The Executive board members and all officer bearers agreed to reach NECHA office, the previous day. CHAI Executive Director Rev.Fr. TOMI IMS, has requested NECHA to organize a SPIRITUAL RETREAT for the Member Institutions (MIs) together with the Executive Board Meet on JANUARY 2015 at the RU Office at Guwahati. The retreat will be animated by a team from CHAI. It will last for 4 full days. If those DU presidents and some MIs could request the Provincial Superiors and make this Retreat as their ANNUAL SPIRITUAL Retreat, it would benefit the Nurse Sisters. NECHA AGBM of 2015, was tentatively is fixed on 25th and 26th of September 2015. If CHAI AGBM is arranged before these dates, then dates of AGBM of NECHA will be shifted to another date by Exe.Board. 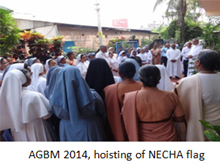 His grace Archbishop John Moolachira inaugurated the AGBM by unfurling the NECHA Flag at 8.45 am on 27th September 2014. Rt. Rev. Joseph Aind, the Ecclesiastical Advisor was present for RNTCP and AGBM. He was the Guest of Honor at RNTCP Review meet on 26th September. Rev. Sr. Prabha SCC, Exe.Director CBCI CARD and Dr.Girish Singh, National Coordinator CBCI CARD, Dr. Pranab Nath, Coordinator, Meghalaya and Dr. Randeep Neog, Coordinator of Assam were the other dignitaries who took part in the various programs. The officers of Assam, STO and WHO consultant of State TB program graced the RNTCP meet on 26th September. The Executive board meeting was conducted by Fr. Paul Thettayil, in the absence of the NECHA president Sr. Rose Alex, who could not arrive at Guwahati due to the flash floods in Garo hills. The annual report was read in the meeting by Fr. Paul and requested suggestions from the 10 DU presidents present. Points discussed were the following. Election of new office bearers of NECHA and proposal of candidates. SPP meets in DU’s before March 2015. Improvement of communication between DU presidents and NECHA office. Agenda of sharing of special experience by MI’s during AGBM, replacing reading of individual reports. This is specific only to AGBM 2014, due to lack of time. At 6.30 PM Bishop Joseph Aind presided over the Holy Mass, for the participants of AGBM. 27th ANNUAL GENERAL BODY MEETING OF NECHA commenced with Holy Mass presided over by Rev. Fr. Tomi IMS Executive Director of CHAI Secunderabad at 6.30 am on 27th Sept.2014. The high point of Gospel sharing was that each participant was asked to share one’s special experience of God with another sitting close-by. The unfurling of NECHA FLAG was done at 8.45 am by His Grace Archbishop John Moolachira of Guwahati at the invitation of Sr. Alice Thomas. 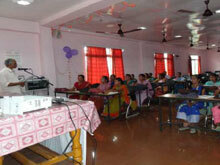 The inaugural function was guided by Sr. Marina Abraham SCC, DU President of Tezpur. 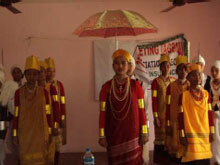 The prayer dance was performed by the candidates from SMI Provincialate, Guwahati. The lighting of the Indian Lamp was performed by His Grace Archbishop John Moolachira, followed by Bishop Joseph Aind, Rev. Fr. Tomi, Sr.Prabha, Sr. Delina and Fr.Paul Thettayil. The dignitaries were welcomed in the Assamese Tradition with a Phoolam Gamucha. Fr.Paul Thettayil, director of NECHA addressed the dignitaries and the participants present and welcomed them, since the President Sr. Rose Alex could not be present due to cloudburst and landslides that cut off all road connections to and from Garo Hills. In the opening speech Archbishop indicated that “the Health care givers should be first healthy, free from all negativity of mind”. Bishop Joseph Aind spoke of having more trust to remain healthy. Mr.Dony Peter spoke of smart work than hard work. Rev. 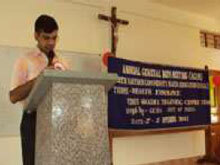 Fr.Tomi IMS in the keynote address spoke on the theme” Communicable and incommunicable diseases, Thrust of CHAI. Through the Power point presentation he tried to emphasize that with all our resources, human and financial, we do not achieve the goal since we do not work together. Sr. Prabha SCC spoke on the need of “empowering ourselves as religious before we can empower others. The need of being a Prophet, standing for truth and Justice as empowered religious, can lead us to fulfill the mission entrusted to each one of us. The post-lunch session was guided by Sr. Annie SMI in order to elect the new Office bearers of NECHA. Through the secret ballot, the assembly voted in the first round the President, General Secretary and Deputy Secretary. Among the proposed Candidates, Sr. Marina Abraham SCC, Tezpur Du President received 31 votes while Sr. Alice Thomas received 15 with one invalid vote that wrote wrong names. Sr. Helen Nongrum MCJ Nongstoin DU President was elected Secretary General with 33 votes while Sr. Anice FCC of Imphal Received 14 votes. Sr. Ancy Joseph CCV, DU president of MIAO received 30 votes while Sr. Annie Jose OSA, DU president of Bongaigaon received 16 votes. The new office bearers were honoured and welcomed with Assamese Gamucha by the assembly. The second half of the afternoon session was dedicated to sharing of special experiences by the MI’s. Sr. Annie SMI shared about the sufferings of Adivasis in Uriamghat caused by Nagas who burnt houses and chased people out of their homes in 7 villages bordering Assam and Nagaland. Fr. Lazar added that the two state governments need to settle the border disputes politically. 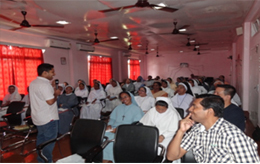 Sr. Alice Thomas MSMHC shared with the others the sufferings caused by flash floods and cloud bursts in Garo hills. The people lost crops, animals, houses and property by the natural calamity. Sr. Prabha asked the sisters what they have done on the clinical establishment act being passed in Assam and in other states. She urged the nurse sisters to remove the board “dispensary” and replace with “Primary care center” or “Holistic Health Promotion Centre”. She encouraged nurse sisters to go the website to learn more about CEA. She adviced the sisters to have a PARADIGM SHIFT in the mind from “Doctoring to Vaidya”. She proposed to go on herbal and natural healing methods, than depending on allopathic treatment. Fr. Paul introduced the aspects of NECHA aspirations and the need of endorsing it through the DU SPP meet in every diocese. He spoke on the history of the RU’s and how CHAI from 2013 is assisting the RU’s and DU’s to learn to network and collaborate between the various commissions within the dioceses and in the region. The short term goal is fixed to 2014 and long term goal fall in 2018. He also spoke about the mapping of resource persons such as DHC and facilitators in every Diocese and resource mapping of various congregations in the region. The newly elected office bearers thanked the assembly for trusting them and electing them to the various offices of NECHA. They promised to work for the improved relationship and quality of work in NECHA. While responding to Fr. Paul’s word of thanks to Fr. Tomi, thanked Fr. Paul the Director of NECHA for his quick response in communicating with CHAI and his efforts to revive the different DU’s of NECHA that were in slumber. Sr. Delina expressed her appreciation to Fr. Paul for energizing the DU’s through the process of SPP. And hour of adoration to the Blessed Sacrament was organized at 6.30 PM in order to thank Jesus for all the blessings, every person received and every effort made by the MI’s to promote health care in the rural areas. The day commenced with Rev.Fr. Johnson Parackal SDB, Director of Don Bosco Institute, Joypur, Kharguli, Guwahati presiding over the Holy Mass and prayed for the Health Workers who participated in the AGBM at NECHA. He congratulated the Nurse Sisters for their dedicated care for the sick and the suffering people in the rural areas. In the homily he emphasized the need of learning the will of the Father and fulfil them after the example of the repentant son referred in the Gospel Mt.21:28-32. Mr. Dony Peter Chacko from Bengaluru was the resource person for the program in which 44 participants took part. He animated them assisted by power point presentation and animations on the following points. 1. Transformation of leadership, after the example of Jesus. When one leader dies another one is born. Jesus empowers his disciples, that they would be transformed, in order to transform others. 2. Shift of mind setup. Human beings see and judge according to the mindset of the person. If we have to perceive new things, we need change of mindset. 4. Do not depend only on our experience in order to evaluate others. 5. Do not underestimate others. 6. Build self confidence and be positive. 7. Do actions and evaluate them. Omega leadership which has four parts. a. START NOW, spend 3 minutes on any task. b. Be aware that we are also part of the problem. c.	Build with love, we need to build people around us. The training program on capacity building concluded by 12.30PM. 63 Sister Nurses took part in the AGBM in which RCTCP Review Meet and Training on Capacity Building were clubbed together from 25th to 28th Sept.2014. Complied by Sr. Ancy Joseph and edited by Fr. Paul Thettayil. 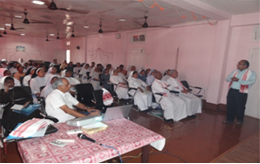 The AGBM of 2015 was clubbed with a first ever meeting of Administrators of all Christian Hospitals of North East Region on 20th august 2015.Archbishop John Moolachira graced the occasion as the Chief Guest who addressed the assembly on the responsibility of adding love to our healing ministry. Rev. Sr. Prabha Varghese, Executive Director CBCI CARD spoke on the need to reach the unreached basing on her own vast experience in Central India. Rev.Fr.Julius Arackal CMI, the President of CHAI and the main animator Ms.Anuvinda Varkey, Executive Director Christian Coalition for Health (CCH) were the dignitaries who graced the occasion. Fr. Paul Thettayil, Executive Director of NECHA, welcomed the dignitaries and the participants. He spoke of great hope for the CCH since he saw for the first time a100% participation of all invitees. Ms Anuvinda played the Key Note address by Dr.M.C. Mathew Chairperson of CMC Vellore, guiding the participants on the evolution of the urgent need of networking in order to make the healing ministry of Jesus relevant. Anuvinda took over the animation from then. She emphasized on the collective witnessing of all stakeholders in the Healing Ministry of Jesus in India, which was led by CHAI. In the formation of a Core team to deal with the health problems and issues faced in North East India, Dr.Vijay Anand Ismavel of Christian Hospital Makunda and Dr.Koshi of Baptist Hospital Tezpur volunteered. The other member was Fr. Paul Thettayil of NECHA. 21st August 2015 was dedicated to the Annual Review Meet of the CBCI CARD. Rev.Sr. Prabha Varghese Executive. Director, Dr.Girish Singh, National Coordinator and the State TB officers were welcomed by Dr.Randeep Neog, who is the Assam Coordinator of CBCI CARD. After the welcome given to various dignitaries, they discussed the urgent of eradicating TB from our Region with collaborative effort. There were presentations from various hospitals as well as State TB Officer. The felicitation of Fr K.C George began at 5pm with a Solemn Eucharistic Celebration in the chapel of NECHA Building Guwahati. The main Celebrant was Fr K.C George the Jubilarian himself, Fr Paul and Lazar concelebrated with him. Sr. Ancy Joseph gave introduction to the Holy Mass and invited Sr. Marina and Mabel, the Silver Jubilarian to the Eucharistic Celebration to thank God for their vocation to the religious life. All Jubilarians came in a procession with colourful lighted candles to the Altar. During his Homely, Fr. George enlightened us on the Mission of Jesus which is handed to us and our responsibility of carrying the same in our lives, healing and reaching the unreached. After the final blessing Fr K.C George was welcomed at the gate of NECHA BUILDING with a colourful golden umbrella. (Muthu Kuda) and taken to the Hall. Sr. Annie SMI anchoring the felicitation program welcomed the founder Fr. George who has completed 50years as a Priest. Sr. Marina Abraham SCC gave the welcome speech and explained the purpose of the felicitation and welcomed the Golden Jubilarian with a golden shawl and a bouquet of flowers. Sr. Mabel and Marina were also greeted with silver shawl and flowers. 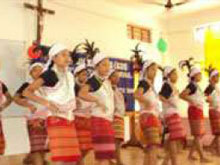 The prayer dance was performed by SMI candidates who invoked the blessings of God. Sr. Marina SCC, welcomed the President of CHAI Rev.Fr.Julius Arkal CMI, Rev.Fr.K C George, Sr.Prabha Varghese, Executive. 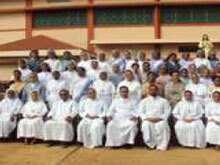 Director CBCI CARD, all Diocesan Unit Presidents, Fr. Paul Thettayil and all the Member Institutions and invited guests. Sr.Merin Sennu FCC in her address gave a brief description of Fr. K.C George and his contributions to NECHA and to the health care programs in the Church of North East. Knowing Fr.K C George for a long time she added variety to her presentation. NECHA presented him with a laptop so that he would be able to write about his contributions to humanity. Sr. Marina, the President of NECHA was presented with a gift too. The Narengi Blind school students of Venerini Congregation presented a Hindi song enthralling everyone. Sr Ancy CCV shared with us a true story to show how the healing ministry is still relevant today. Miss Tina Borah presented a Krishna Dance. She is the gold medallist of All India Students Kunfu competition. The WDC Students presented a colourful dance. 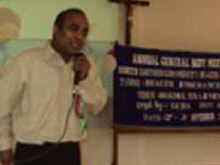 Fr K.C George in his talk shared with us the origin of NECHA, his struggles and achievements in founding NECHA. He invited us to continue reaching out to the unreached as Jesus the healer of all. He also invited us to form small health groups in the villages and teach the people responsible taking care of their own health and that of others. Sr. Alice Thomas MSMHC thanked everyone for organising and participating giving honour to Fr.K C George Founder of NECHA and the Golden Jubilarian. In the Dinner that followed 120 invitees were served 12 delicious Vegetarian ONAM dishes. The Archbishop John Moolachira and priests and religious of various congregations and institutions and close neighbours of NECHA graced the occasion. Cake and "Payasam" were the concluding items of the Dinner. The day begun with the Holy Mass at 6:30am in the chapel. Fr K.C George, in his homily emphasized the importance of service with strong faith in Jesus and the need to share this faith with all whom we serve. The NECHA flag was hoisted by Fr Julius Arackal the CHAI President, followed by the inaugural function anchored by Sr Marbel VSDB. The ceremonial lamp was lighted by Fr K.C George, Fr Julius, Fr Paul, Sr Maratha SCCG, Sr. Marina followed by short prayer service led by Sr Icydora and Sr Marbel. Sr Marina Abraham SCC, the president in her welcome speech quoted the words of Nelson Mandela, saying "our deepest fear is not our weakness but our power, not our darkness but our light ". She invited us to be liberated and to liberate others and by letting our light shine forth. Fr K.C George, Fr Julius, and Fr Sunil the president of CHAI Kerala, Sr Prabha Varghese, Sr Martha and Fr Paul were welcomed with phulon Gamucha. Fr Julius begun his first session with the word of Pope Francis that the church is missionary and Christ sends us on a mission. Then he went on with the motto of CHAI love of God compels us, Attitude makes the 100% result of our work. All depend on our Attitude. Then he went on explaining about our strengths and challenges. Major Strengths: Success VS Happiness, Happiness VS Commitment, Our coming together, for a common goal, desire for quality and our willingness to share. Motivating people to commit themselves, to create ownership, empower associates to make right decisions and sharing the benefits. He stressed that authority has to be linked and soaked with responsibility. Then he taught a group game to help us to evaluate the process of success. Fr Julius went on with repositioning health ministry in India 2020. The CBCI Commission for Health and CHAI are working in collaboration with CCH for the said purpose in the National, Regional and Diocesan Levels conducting Strategic Planning Process in every diocese. To this purpose, repositioning retreats, and formation of advocacy Units at National and Regional levels were proposed. Fr Paul the director of NECHA shared the difficulties of attaining the desired purpose of strategy of planning in different Dioceses. He also emphasized the importance of setting goal for health ministry, and procuring medicines and equipments much cheaper through Common Purchase, to make it affordable to poor people. In the afternoon session, there were elections to Vice-President and Treasurer to NECHA. Two names were proposed by the Board for the two offices. Sr. Alice Thomas President of Tura Unit won in the run for Vice President, by 22 votes against Sr. Annie Jose OSA (7) of Bongaigaon. Among the proposed names for the office of the treasurer Sr. Annie Jose OSA won by 23 votes against Sr.Dayamani Narzary (6) President of Diphu Unit. Sr Alice MSMHC and Sr Annie Jose were felicitated and welcomed with traditional Gamucha. As the term of Sr. Mabel as CHAI Executive. Body member from NECHA expired and she expressed her desire to be freed from the office, the Executive Board of NECHA had unanimously proposed Sr. Ursula Indwar MSMHC, President of Dibrugarh Unit. Since no other name proposed, there was no election to the office. Sr. Ursula gave her consent to Sr. Marina, the President over the phone as she could not travel to Guwahati due to a sprained angle. Sr. Ancy Joseph CCV Deputy Secretary read the report of 27th AGBM.Sr. Marbel VSDB seconded the report and was passed. Fr Paul presented the report of NECHA activities as well as the financial report. 32 members were present for the 28th AGBM. Fr Lazar in his thanksgiving speech congratulated Fr K.C George the golden Jubilarians and concluded with thanking the participants and all the staff members of NECHA. 28th AGBM was concluded with a short prayer. The AGBM 2016 of NECHA started with meeting of the members of the Executive Board on 12th August 2016 at 9.30am. The report of 89th Board Meeting was read by Sr. Helen Nongrum the Secretary and it was passed with some corrections. a) The AGBM commenced with the unfurling of NECHA flag by Rev.Fr.Sebastian Ouseparampil, Director of DAN, and Nagaland. After the Inaugural prayer, the members participated in the Inaugural function in NECHA hall, where Rev.Fr. Sebastian was the chief guest and Archbishop John Moolachira was the guest of honour. Sr. Marina Abraham, President of NECHA welcomed the guests and participants, in the traditional style. Prayer dance by students of SMMI, Baridua and a song by children of blind school Narengi Jyoti Niketan, were the highlights of inauguration. 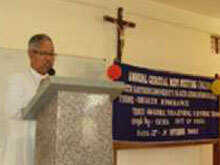 Key note address of Rev.Fr.Mathew Abraham Executive Director CHAI was read by the president. Archbishop, in his exhortation, spoke of the demands of Health Care in the world today and spoke of the reason of its decline. Fr.Sebastian, in his presentation, spoke of the reasons of Cancer, the poisonous food we consume in various forms and suggested natural cures available in Ayurveda. The theme Cancer was dealt by Dr. D. Barman & Dr. Abhijit Talukdar of the D Baruah Cancer Institute Guwahati. They dealt with Cervical and Breast Cancer respectively. They dealt with risk factors, symptoms, necessity of early detection and treatment, and causes of the illness. b) The meeting reminded the DU Presidents to have a faster and speedy communication with NECHA Office. The Nurse Sisters and Member Institutions must meet together for sharing their experiences and thus enriching and supporting each other. The member Institutions of each unit need to be visited by the DU President occasionally. The reason is that health care activity of today does not bring in money to support itself. Hence all concentration goes to school activities and Social works supported by some Funding Agencies. c) In some Dioceses, a health coordinator is appointed (DHC) without any agreement signed between the provincial and the Bishop, to ensure the smooth functioning of DHC and no facilities are provided to the DHC (Monthly stipend, travel expenses of the DHC, office space, and computer and communication facilities). d) The coordination of MIs is to be done by the DU President of every Diocesan unit and not to be delegated to a priest who may be the health commission secretary of the diocese. e) The President of NECHA reminded the members to send the annual report of their DU at least a week before the AGBM in order to present a compiled annual report of the members of NECHA. f) The Pastoral conference of the region to be held at NEDSSS from 12-15th September 2016 commences with Sainthood celebrations of Mother Teresa of Kolkata on 12th September at 6.00pm in the Guwahati Medical College Auditorium where all religious heads and top civil authorities are to take part. 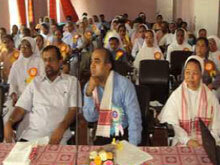 Sr. Alice Thomas, Vice president of NECHA, was entrusted to speak to the major superiors attending the pastoral conference on the proposed CHAI National AGBM in Guwahati in 2017.
g) The blessing and inauguration of National Medical Services Consortium (NMSC) store house was done by the Archbishop John Moolachira in Sonaighuli at 3.30pm and all members of the Board attended the function. 30th AGBM of NECHA was held on 26th August 2017 at NECHA Building 6th mile, Guwahati. The theme of the AGBM was “Role, Responsibility and Relationship of MI, DU, RU & CHAI”. The facilitator of the day was Rev. Fr. Mathew Abraham CssR, M.D. Director General, CHAI. Bishop Michael Akasius Toppo of Tezpur was the chief guest and Bishop Joseph Aind, special guest. The days programme started with the hoisting of the NECHA flag and the Holy Mass. In the Board meeting held on 25th August, 2017 a homage was paid to Sr.Ursula Indwar President of CHAD and CHAI Executive Member from NECHA region, who passed away on 25th May, 2017. Prayer was offered and one minute silence was observed. Rev.Fr.Mathew Abraham-Director General of CHAI, Sr.Marina Abraham-President NECHA and Fr.Paul Thettayil-Director NECHA participated in the funeral of Sr.Ursula on 26th May, 2017, in Dibrugarh. The new DU presidents, Fr.James Thangshel of Imphal, Sr.Prema Misquith BS of Agartala and Sr.Mary Concepta Pasi FMA of Jowai were welcomed with gamocha by the other members. Sr.Alice Thomas of Tura DU who volunteered to be administrator of NECHA and was released by Rev.Sr.Mary Thdavanal, Provincial superior Guwahati Province, was also welcomed with gamocha. The members proposed Sr.Lizzie, Sr. Blinda and Sr.Mary Pasi to the post of executive member of CHAI. Since the term of the president Sr.Marina expired, names of Sr.Marina and Sr.Irene Crasta were proposed to be elected by the General Assembly. The members proposed a revision of contributions to NECHA. The unit contribution of every diocese Rs.500/- (Earlier was Rs.300/-) and individual contribution to AGBM participation would be Rs.200/- (Earlier was Rs.100/-). In the business session at 2.00 pm, Sr. Marina Abraham was re-elected as President, and Sr.Lizie was elected Executive Board Member of CHAI. The AGBM concluded at 4.00 pm with a vote of thanks by Sr. Irene Crasta, president Aizawl Diocesan Unit. Designed & maintained by Web.com (India) Pvt. Ltd.